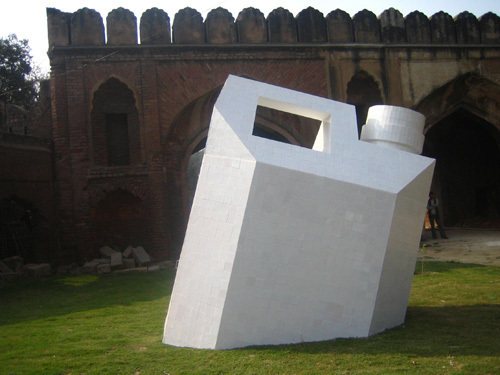 Atul Bhalla, Chabeel, 2008, sand, cement, water, ceramic tiles, stickers, recyclable paper, plywood, video projection, dimensions variable. Installed outside the gallery, Atul Bhalla’s Chabeel, 2008, appears to be a giant’s gleaming white jerrican. But within the edifice, a worthy activity is in progress: Here Bhalla offers dehydrated visitors paper cups of mineral water. The dregs of water left behind are mixed with sand from the Yamuna River and cement to fashion tiny blocks, mini-monuments that are stored in Chabeel. Investigating the role that people play in enshrinement, the work gestures to the aquatic nature of many Hindu rituals: The holy river is the favored site of religious ablutions (despite being abysmally polluted). Inside the gallery, Bhalla’s installations and photographs also tread water. The piau, a stand found in public places in Old Delhi, is a disappearing feature of urban existence. Intrinsic to the traditional northern Indian custom of providing free water to the thirsty, such niceties have been dispensed with in swanky sections of the capital. Piau II, 2009, consists of a washbasin and two faucets gushing water. The splashing sounds are strangely calming––yet curious visitors might learn that the water is collected in buckets hidden beneath the sink and recycled. Bhalla’s exhibition is not just a plea for conservation, however; it also addresses the centrality of water to Delhi’s community-based identity. Photographs of the Yamuna and those who live off it reflect this tricky juggling act: Some are intriguing; others are too obvious in their reiteration of the romance of the river. Real Water, 2009, conveys the tussle between individuality and communal existence cleverly. Arranged like bricks in a grid over a vast wall are forty-eight snapshots of pump houses, the structures responsible for Delhi’s water supply, which dot the Yamuna’s western embankment. Photographed in midday heat, the cottages seem to vibrate, their details becoming difficult to tell apart. Do they depict myriad entities, or is their multiplicity an illusion?